Art fairs are typically a conservative affair. Buttoned-up gallerists with business cards hawk their most sellable wares. But with the political upheaval in the world, a pretty picture to hang above a couch in a condo is the last thing on many people’s minds. 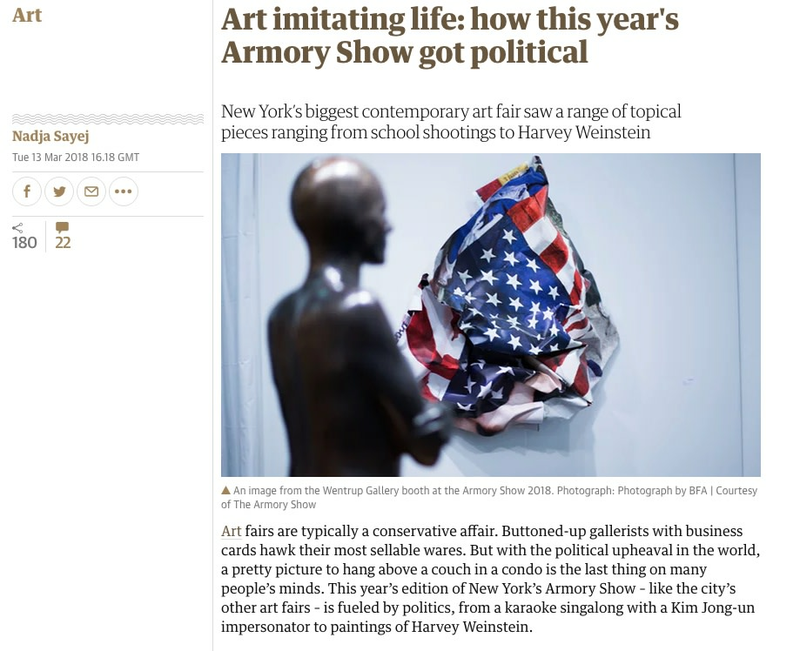 This year’s edition of New York’s Armory Show – like the city’s other art fairs – is fueled by politics, from a karaoke singalong with a Kim Jong-un impersonator to paintings of Harvey Weinstein. As the Armory Show’s director, Nicole Berry, says: “We’re committed to showing critical artwork in a changing cultural climate,” but that’s not where it ends. The work on view here taps into the recent flurry of gun control to sexual harassment suits, presidential portraits and fake news. If any artist calls out Trump media bias, it’s Brooklyn artist Cynthia Daignault, who shows a series of 15 portraits of the president from American newspaper front pages, which are also on view at Independent. A painterly cover of the Los Angeles Times reads “Stunning Trump Win” while the Boston Globe front page proclaims “A Trump Shocker” with the president holding a thumbs up. Daignault points out the political divide, as some papers glorified Trump’s triumph, while others downplayed the victory. “The role of Trump, sensational news and the media plays on reporting on truth proves that newspapers may be a truth industry, but it’s also a business at the same time,” she says. What about the police use of guns? At the New Art Dealers Alliance (Nada) New York art fair, Alexandra Bell shows a piece called A Teenager With Promise. The artist edited a front page of the New York Times from 2014, which paints Michael Brown, an unarmed teenager killed by Ferguson police in 2014, as “no angel”. The Times headline read “A Teenager Grappling With Problems and Promise”, but Bell edits the cover to read “A Teenager With Promise”. Bell’s piece was initially a work of street art in New York, which led to an op-ed apology from the Times’ public editor, but here, they’re presented in framed form. With potential talks between the US and North Korea in prospect, Brooklyn-based Korean-American artist Seung-Min Lee staged a karaoke performance dressed as dictator Kim Jong-un and singing for “karaoke diplomacy”. The artist, who dressed up in military regalia, black-rimmed glasses and Kim’s trademark paunch, explains that the DPRK’s ideals are met “through the magic of song”. And, apparently, sarcasm: she stood before a phallic-shaped missile while singing a cover of Bruce Springsteen’s Born in the USA but as “Born in the DPRK”. With North Korea’s recent splash at the Olympics, maybe it isn’t so far-fetched, after all.